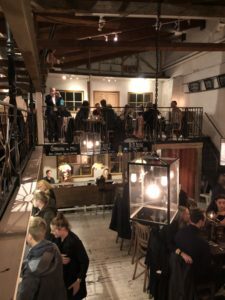 Göteborg (Gothenburg) is sometimes said to be the Capital city of beer in Sweden – and it is very easy to agree when you walk around among many nice beer places, serving beers from many local breweries as well as from many other countries. 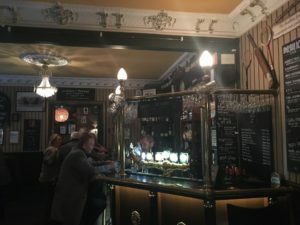 This pub guide on Göteborg Top Beer Places, is compiled and updated from how fun Beerik think it is to visit these places from a Craft Beer point of view. Places with lower ratings can naturally be very good from other points of views. 3,5 % PLACE = Indicates this is a place with beers containing maximum 3,5% alcohol only. Underlined areas are located in suburban Göteborg. Area codes, see below. AV – Avenyn avenue and the blocks around. LI – Linnégatan street and the blocks around. Areas without code but the full area name, are located in a more suburban part of Göteborg. Rather common places are closed Sundays and/or Mondays. 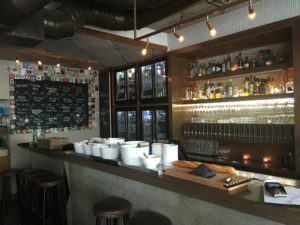 A beer bar that is highly acclaimed for its frequent rotation and for having almost only interesting beers on the 14-16 taps. Around 90 bottles. There are often events with tap take-overs from visiting breweries, recently with Finnback Brewery from New York. 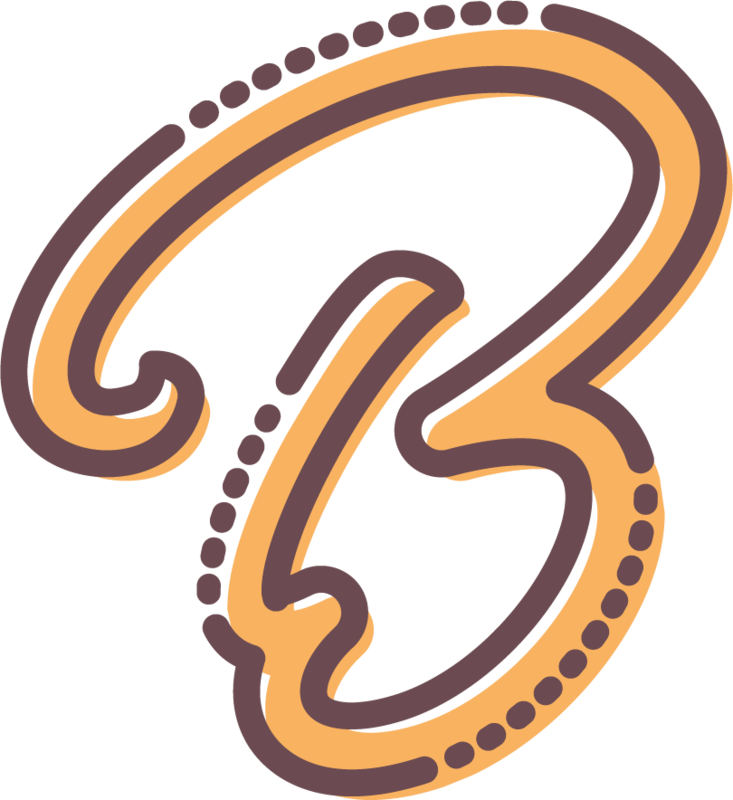 This second Brewers Beer Bar is a recent addition to the Göteborg Craft Beer scene. 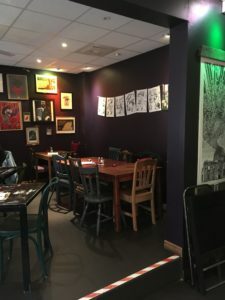 It is situated in another hip area close to both the 2112 and Basque places, and maybe oriented towards a less nerdy crowd than the sister bar. Similar tap beer selection, with 14 local and foreign taps rotating frequently. Bottle selection is not yet as good, but holds some 70 different beers including Belgian sours. Beer Events occur often – sometimes together with the sister bar, sometimes only here. (Opened 2018). 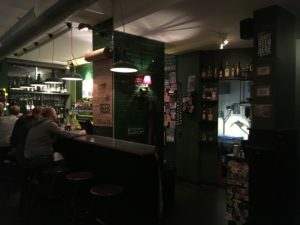 A solid hangout on the Göteborg beer scene since 2009 (where the classic bar Delirium Café once was located). 34 taps in total with around 25 Craft Beers including some Belgian ones. Not all taps rotate, but with around 240 bottles on the list and a full food menu, one can spend a long evening here. 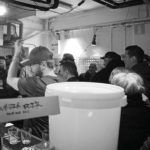 Occasionally, there are beer events, e.g. when Naparbier from Spain made a collab with local Beerbliotek. MH – Första Långgatan 32 OS W The place has now a temporary bar due to rebuilding. An institution of beer in Göteborg. The temporary bar at the corner of the house holds 13 taps with almost entirely Craft Beers. The place has had several refrigerators filled with local and imported Craft Beer bottles. 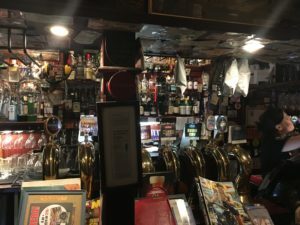 However, there are also two different cellars filled with vintage beer bottles under the pub, making a very interesting selection that is now a bit difficult to overlook – especially with regards to the rebuilding. There are certainly more than 250 bottles. 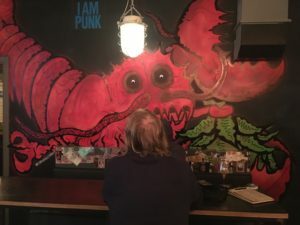 This place runs beer events regularly, like beer releases and tap take-overs. 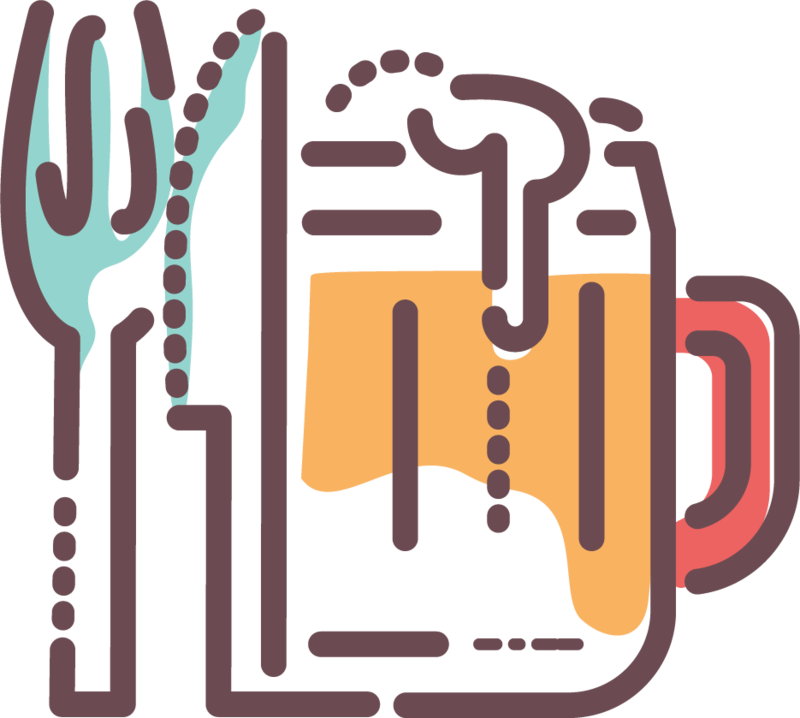 Once a year they host their ”Haket beer festival” within the pub, presenting local as well as foreign breweries. 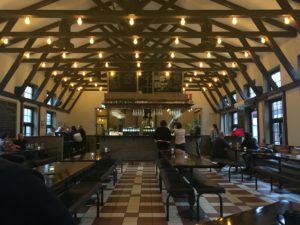 BEER EVENT: June 1st: BEER SHOCK – 10 fantastic Breweries invade Masthuggstorget – AND Gamla Stan in Stockholm at 19 Glas, Sjätte Tunnan, Tritonia and Wirströms Pub. The original brewpub in Göteborg, with its own small batch brewery served exclusively (?) at the bar. 16 taps with only Craft Beer of local and imported origin. Reza, the owner, claims he has served Tripel Karmeliet for fourteen years uninterrupted. There is also a quite impressive bottle selection on display of around 80 bottles including American/Belgian/Dutch/Swedish vintage as well as a few rarities ”not for sale”. Dogs are welcome if the neighbor tables give their allowance. Cozy cellar bar in recognizable Bishops Arms style with inspiration from English pubs. Around 14 Craft Beer taps (26 taps in all) and one is almost always a Real Ale/Cask. Approximately 130 different bottles, in few fridges well visible from the bar. Make sure to look around for seating areas in the many vaults. 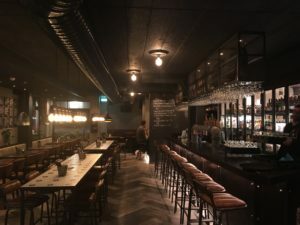 The typical Brewdog bar, in Göteborg. Maybe 14 Brewdog beers on tap and around 12 guest taps. Somewhat limited and varying selection of around 35 bottles/cans but some might be interesting. The burger menu is worth checking out, especially the one with goat cheese. Modern style interior in an area with not so many Craft Beer places. 15 taps providing around 12 Craft Beers. Around 65 Craft Beer bottles. A ‘striking’ interior and waiters dressed in bowler hats, corsets and 1920’s goggles along some militaria. 9 interesting Craft Beers on tap with a good rotation. Also around 130 bottles including rarities like several Eclipse and other foreign goodies. Holds events regularly, like a Stout and Porter week, or evenings with tasters from big bottles. Dogs are allowed if there are no dogs before..
Busy burger and beer bar with Rock memorabilia on the walls. 10 Craft Beer taps (out of 23 taps) and around 70 nice bottles. Serves their own house IPA called “If You Want IPA (You’ve Got It)”, made by the local brewery Beerbliotek. Accessible and friendly Bishops Arms in the very heart of the Swedish West Coast Craft Beer area – Järntorget square. A lot of taps including around 11 Craft Beers and around 130 bottles. 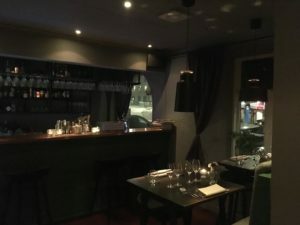 Located just outside central Göteborg this bistro pub has a clean and nice interior. 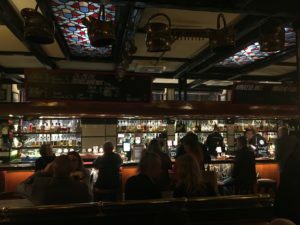 There are 16 taps having Craft Beers (apart from some Carlsberg brand taps), including 2 house beers (pale ale and lager) from local brewery Spike. 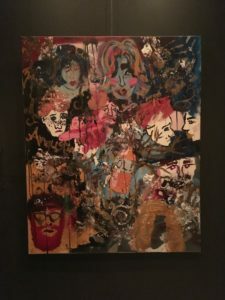 There is also a good bottle selection with approximately 130 items including a wide selection of local brews along some Brooklyn, Lagunitas and Fullers. 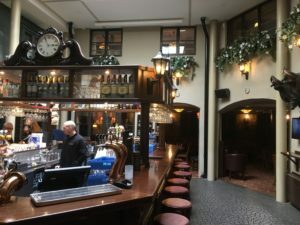 Reopened after renovation 2017, the bar and seating area is nice and tidy. Old style interior with black painted wood in the ceiling. There are 28 taps of which around 10 are Craft Beers. There are some 70 bottles, which all are on display above the bar. As at the other Tullen bars, the food menu is classic and worth the modest prices. As close to the Basque country you get in Göteborg. 5 beer taps not very interesting, but shelves reaching the ceiling with around 150 bottles. Selection includes several Belgian and American sours as well as local hop juice and German Pilsner. 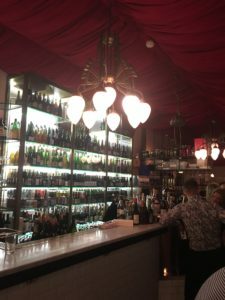 Serves bar made pintxos – mouthbites on bread – as well as Basque cider and wine. 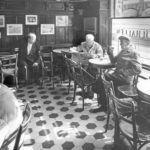 One of the pioneering brewery tap rooms of American standard – except for some limitations in serving due to legislation. Serves 20 cl/6 oz samples of their own beers, some from taps and most from bottles. This include normally something fresh from the fermentation tank as well as something vintage. The room is decorated but simple, being a part of the brewery. 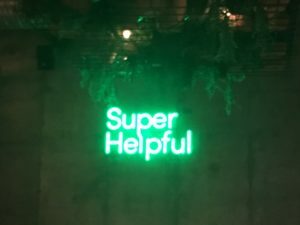 Has now started to be open every weekend. Pretty cozy bar in a basement. On weekdays a dinner place for hotel guests, but living up to a proper pub hangout on weekends. 30 taps including around 8 Craft Beer taps with a fair rotation. Around 90 bottles, among which there are a few big bottles from Belgium and The USA. As at other Bishops Arms pubs, there is a good whisky selection. Open until 3 a.m. this pub/nightclub attracts a varied crowd including the partying youth. 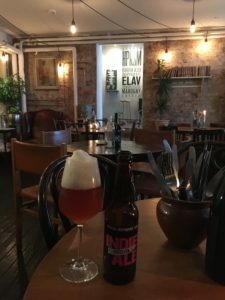 Beside the standard Spendrups taps there is a quite interesting craft beer selection that includes bottles from all over the world, including the African continent. A recent re-orientation of the beer selection still gives around 9 Craft Beer taps and approximately 90 bottles, in all. Smaller dogs are welcome, if there aren’t too many before, but somewhat bigger dogs preferably during the day instead of crowded nights. A good example of mixing selection from a major distributor with independent Craft Beers. Of the 21 taps there are around 8 Craft Beers, for instance from Oppigårds, Beerbliotek and local Spike and Dugges. The fridge holds some around 120 bottles including Belgian, American and Swedish Craft Beers. Dogs are welcome if they are of the smaller kind. A late night hangout in weekends, in between Järntorget square and major street Avenyn. Standard distributor brands in some 14 taps, but a fine selection of around 180 nice Nordic bottles available, including Amundsen, Beerbliotek, Brekeriet, Brewski, Dugges, Mikkeller, Omnipollo, To Öl and Ölvisholt. By the way – the Omnipollo bottle selection is outstanding – 30 different Omnipollo bottles! 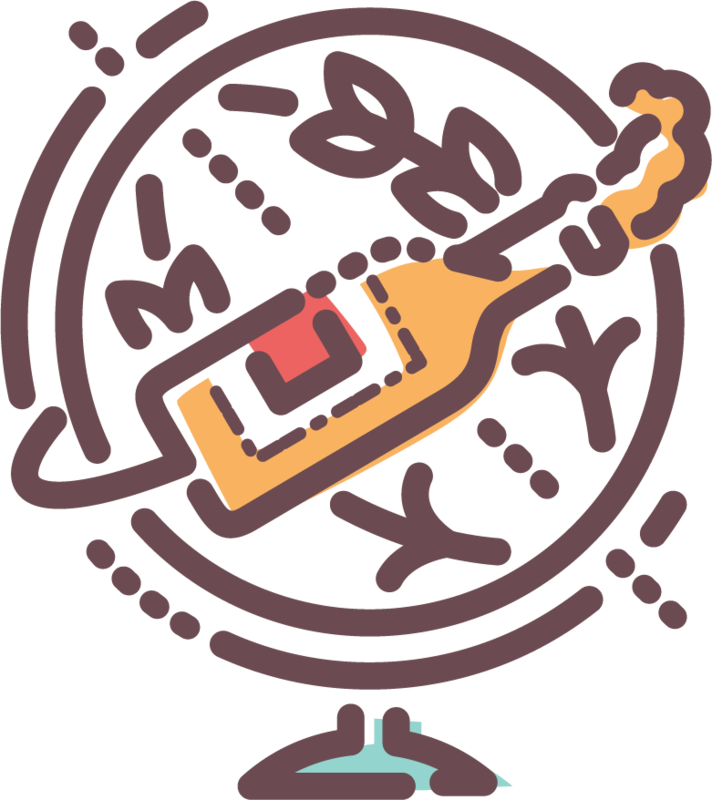 However, sometimes the rotation on certain bottles can be questionable, so check the bottling date. A nice but simple interior with both a table seating area and a spacious bar seating as well. 20 taps of which 8 are Craft Beers. 2 taps pouring Norrlands Guld (Swedish non-Craft Beer). Some 110 bottles of Swedish Craft Beers. 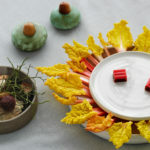 Robust Swedish dishes at moderate prices, as at the other Tullen bars. A wide selection of Swedish beer, with a lot of local breweries represented. 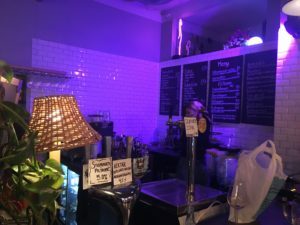 8 Craft Beer taps including rotating local brews, besides a few standard beers like Norrlands Guld. Around 140 different bottles of Craft Beer. Quite spacious inside with wooden interior and a built-in outdoor seating area, covered and heated when needed. The food is worth trying with solid, traditional Swedish meals at modest prices. Dogs allowed only at the built-in outdoor seating. 20 taps of which around 8 taps are Craft Beers, besides some of the non-Craft Spendrups brewery distribution. Around 110 bottles including a fair selection of Brekeriet and Omnipollo among several local brews. 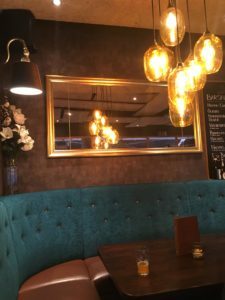 As it is situated at ”Avenyn” it might be busier than the other Tullen bars, and is frequented by a range of customers, including youngsters, shoppers and one or another chronic. Old cinema still in operation with a food Café that is owned by the same people as Stigbergets Brewery. Hence an always interesting selection of 5-8 Stigbergets’ beers on the 8 taps, besides unfiltered Pilsener Urquell. There are normally around 8 bottles. There is also a cozy bar in the cellar with an outdoor seating, hosting the same beers as upstairs. Food is vegetarian and highly appreciated by local hipsters. 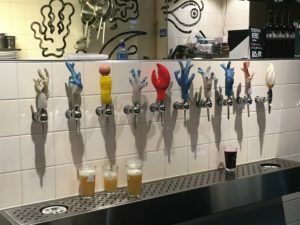 Beer events do occur -there was a tap takeover with Omnipollo and an anniversary party with O/O in the bar. Dogs welcome downstairs. 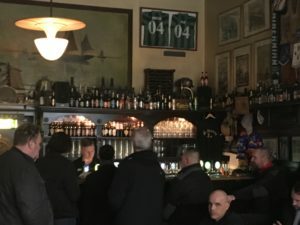 A classic Göteborg hangout for drinking pints. It is also an Untappd ”Verified Venue”, for tickers. The nickname “Blöta Lövet” (Wet Leaf) being a Swedish pun. Around 11 Craft Beer taps and approximately 50 bottles. Interior draws inspiration from classic English pubs. Soccer on big screen. There is a permanent ”outdoor” seating area, covered and heated when needed. A surprisingly mixed crowd in an area with a lot of students. At sunny days the outdoor seating is really baking. Taps of mainly Swedish non-Craft breweries including the regular Gotlands brews, but around 7 taps with a few rotating, mainly local, Craft Beers. 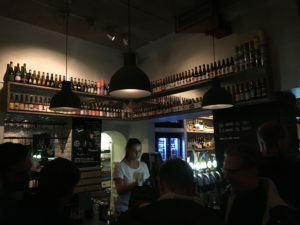 Around 140 (Swedish) bottles in good order including a good selection of Omnipollo, Dugges and Brewski brews as well as a good assortment of local breweries including Electric Nurse, Qvänum, Mohawk and Poppels. The students in the area testify that the food is worth having – at modest prices. Across the street from 3 Små Rum, this more ordinary pub is located. Yet a solid Craft Beer place with 5 rotating Craft Beer taps besides standard taps and a Beavertown. Around 60 bottles from a widely varied origin adds to the pleasure. The place is located in the cultural reserve area, “Klippans Kulturreservat”, which is really a beer historic area of huge dimensions. The porter brewery “Carnegiebryggeriet”, started 1808, got its name 1836, when Scotsman David Carnegie Jr bought the bankrupt company. In 1928 it was bought by Pripps (Nowadays Carlsberg). The famous Carnegie Porter (oldest trademark in Sweden), is still brewed, but since 1976 elsewhere. 2 local Craft Beers on tap. Around 12 different porter bottles and 30 other Craft Beers on bottle. Sometimes tastings of different porters. Walking tours are arranged, sometimes including tastings. Also the close by Waterfront Hotel, where the old Carnegie Brewery was located, have some knowledge of the walking tours. 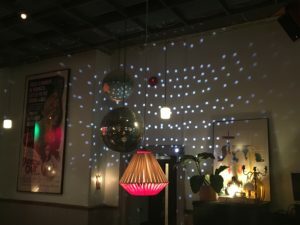 One of the latest additions to Göteborg hipster food scene, is this conglomerate of a club, a lunch café, a craft beer bar and a gaming hall inside. 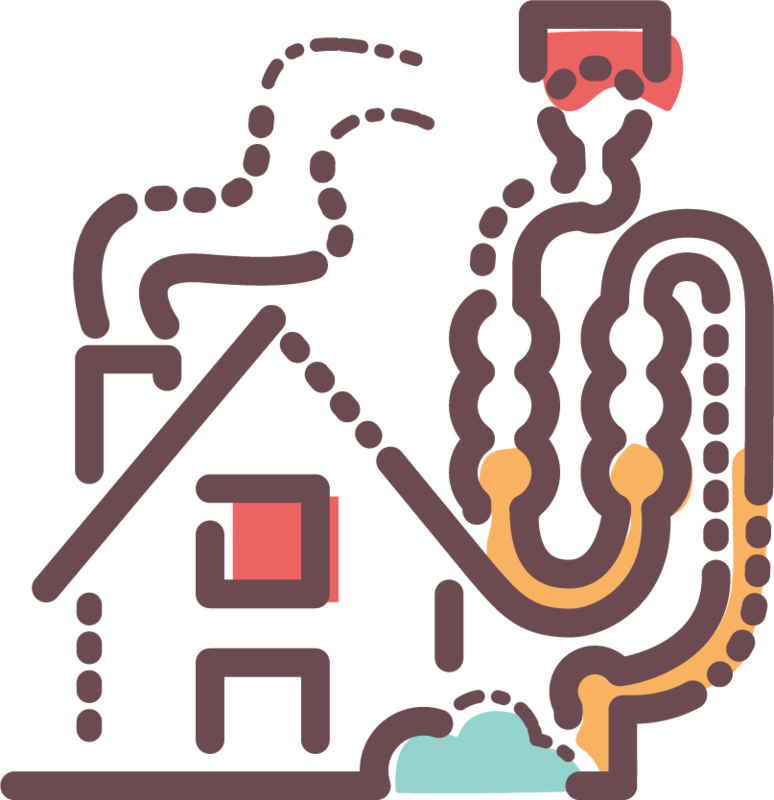 Find your way far inside, to the big Craft Beer menu telling of some 9 Craft Beer taps besides some non-craft stuff. There are also some 35 bottles of almost only interesting craft, though you might need to ask for a complete list of those. The brunch menu is very nice, including a nice smoked salmon and pickles. 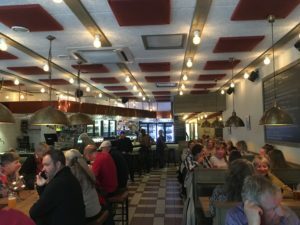 The interior that you recognize from the other Tullen beer bars, and similar setup. Modestly priced, hearty food and Swedish beers. Here in a somewhat cozy but smaller setting as well as narrower beer selection. Some 6 taps of craft, beside the macro stuff, and about 60 bottles. 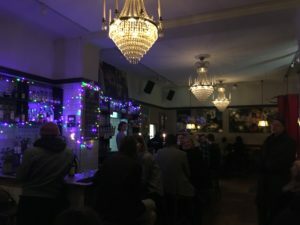 Here is a somewhat odd bar in the Göteborg beer scene. 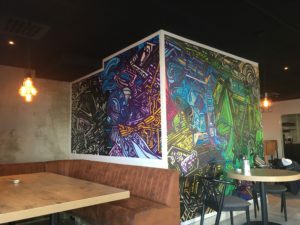 Being a student bar that (we think) enjoys tax reduction, you find very modest prices – as well as modest interior design. They do welcome non-student guest as well! 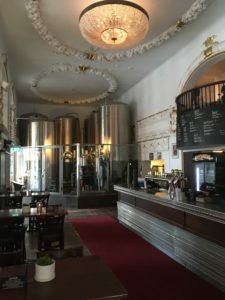 Don’t be fooled by the humble setting, though, there is a very interesting beer assortment of approximately 40 craft bottles including American sours and Belgian spontane beers, Czech pilzner as well as some barley wine. A few local options might be there as well. The menu has a good rotation, too! 2 taps which might be out after exam parties, though. The Brewery Sad Robot opened a brewpub in the very brewery. 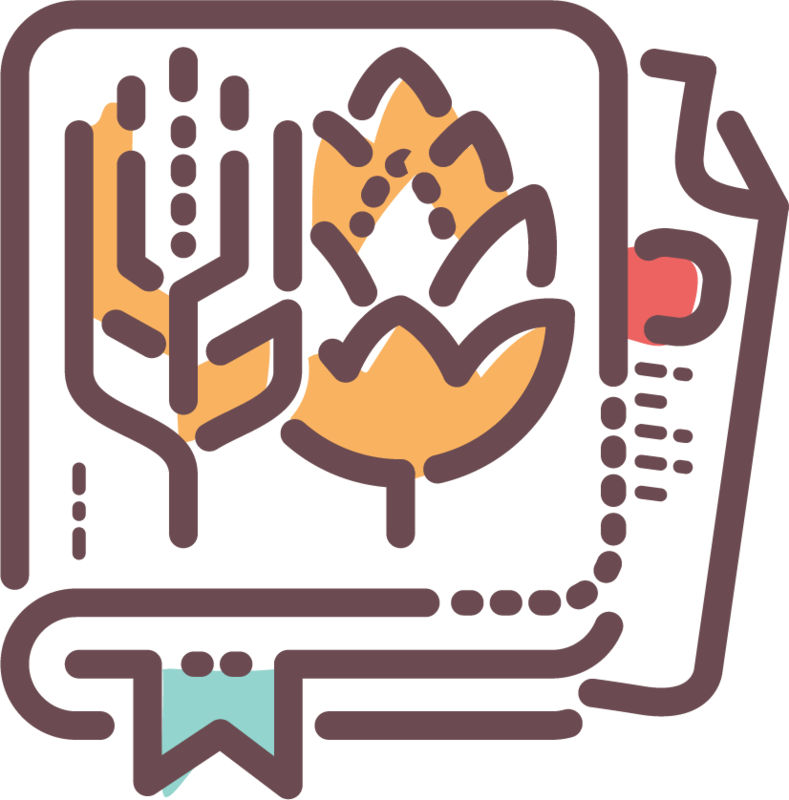 The ambition is to be open the last weekend Friday and Saturday every month, but check homepage/Facebook for opening hours. Twelve taps and a few bottles of mostly their own beer. Occasionally, it was crowded and a very long line to the bar, but that varies. There is basic bar food. 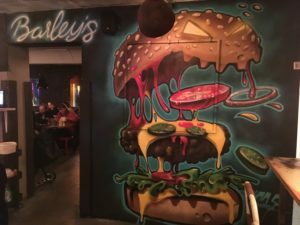 Located a (long) walking distance south of Liseberg amusement park, this not very old establishment serves burgers, sliders and bbq, along a fair assortment of beers. The 5 taps include mostly Craft Beers. There are around 60 craft bottles including some American hops as well as a few local options. Try ordering with the Facebook Messenger app! Once a month arranging Beer Maker’s Dinner with local breweries. A brewpub opened in August. Around 10 of their beers from tap, bottles and fresh beer from their storage tanks. Open at present most Fridays and also the last Saturday each month. Behind the porch-like first bar counter room there is also nice inner rooms a few steps down. 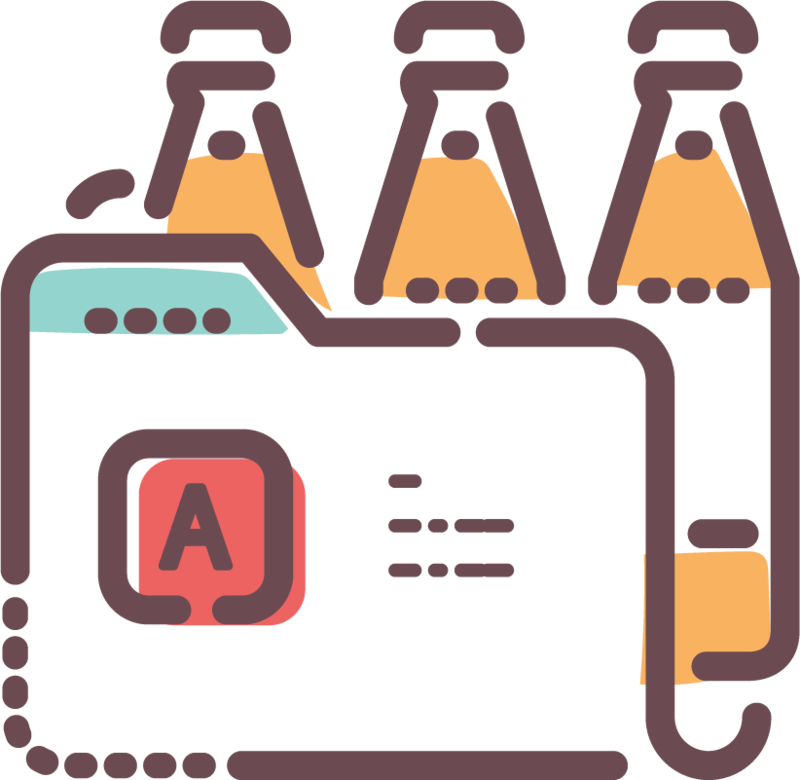 Around 40 Craft Beer bottles of varied origin and 18 taps of which around 5 are Craft Beers, mostly local, let you have a fine Craft Beer moment. One of many bars on ‘beer street’ Andra Långgatan with a selection of Craft Beers along standard distribution. There is often 6 interesting Craft Beer taps and some 50 Craft Beer bottles. An odd finding by a cozy suburban canal, just off major commuter hub Hjalmar Brantingsplatsen. Around 5 Craft Beers on tap and around 20 bottles, sometimes with an unusual one. There is a Craft Beer ambition, though, with occasional tap takeovers, for example with neighboring brewery Vega. Nice slightly rustic place. Providing 10 Australian bottles – and another 4 “newly arrived” Australian bottles! – indicates a nice rotation! Around 12 non-Australian Craft Beer bottles. The taps are maybe not so interesting, 7 non-Australian Craft Beers, around 3 of them being Innes & Gunn and 1 is a rotating guest tap. A popular and hip place. 5 Craft Beer taps, for instance Stigbergets and 3 Craft Beer bottles. Nice place with a suburban feeling. 3 Craft Beer taps and aroud 40 Craft Beer bottles. Nice big place with a fine outdoor seating perfect in the summer. 3 Craft Beer taps and around 30 Craft Beer bottles. 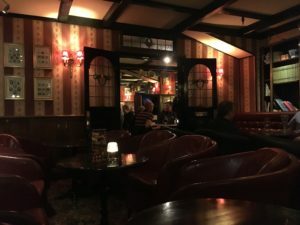 Old English-style pub with 17 taps of which 12 are Craft Beers – mainly from local brewery Lycke. Maybe 1 interesting bottle in the fridges. A bit cramped, especially at lunch time, but also cozy. (Opened 1991). A restaurant just off main street Kungsportsavenyn, attracting a mixed crowd. The name might sound more ambitious than it is, but there are beers. With 16 taps from major distributor Spendrups, only Craft Beers are 4 Firestone Walker and 2 Craft Beer guest taps The rest is standard brews with limited rotation. Some 70 bottles of Craft Beers, including local Electric Nurse and Hönö breweries. Open until 3 am on weekends, this Danish themed joint attracts a mixed crowd. 6 Craft Beer taps. Though a Danish theme, there were no Danish beers on tap in March this year, except for Carlsberg. But you can have Danish typical smørrebrød and schnapps. 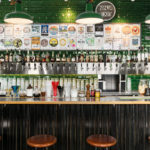 Often 6 craft beer taps and approximately 15 – mostly interesting – bottles. 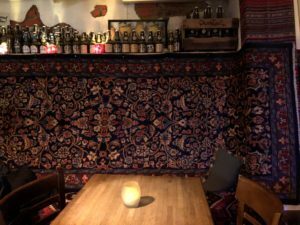 Your unusual Dutch themed bar with pretty rustic food and a vintage touch. Approximately 25 bottles of around 4 are Dutch, the rest mainly Belgian ones. There are some unusual brews for the Swedish market, along with a few Trappist. The five taps holds for example Bavaria and another Dutch beer and 3 other Craft Beers. 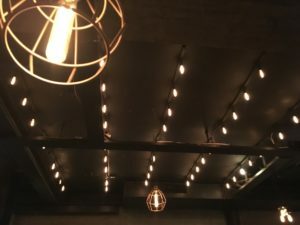 A local bar, connected to macro brewer and distributor Spendrups, which gives the 16 taps a certain bias towards macro lager. But they include around 2 taps Firestone Walker and occasionally Beavertown. Some 50 bottles of mostly local Craft Beers. There was a Firestone Walker event including legendary stout Parabola at more than modest prices draw attention to the bar, and that might happen again. Around 50 Craft Beer bottles, but not so interesting beers on tap. 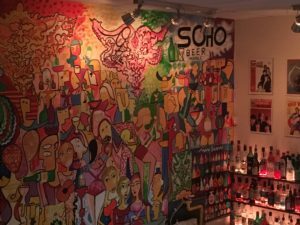 One of the many beer bars around Järntorget with a modernistic interior wall painting. The beer fridges holds some 90 bottles of Craft Brews, though the 12 taps are of standard selection of non-craft beers. Dogs are maybe not allowed on crowded weekends. A hip and acclaimed Italian restaurant that is not too pricey. 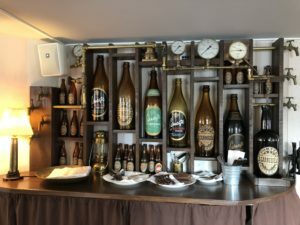 You might don’t want to go only for the bar, but with your osso bucco or tagligatelle, you can usually get around 20 different cooled beer bottles, out of 30 rotating ones, from Italian brewery Elav only. Also 1 tap with Italian beer and 2 others like Lagunitas and TT. Small nice rustic and trendy place. Usually 2 Craft Beer taps, often one from O/O Brewing and around 20 bottles. Simple out-door seating with just plain seating benches. A nice restaurant close to the canal with some 25 Craft Beer bottles with a good variation. No Craft Beer taps. 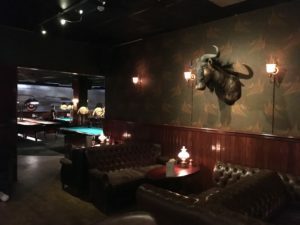 Somewhat unexpected as a Craft Beer bar, this pool and shuffleboard venue is more stylish than your average murky hangout. The 25 beer taps do however not include any Craft Beers. But there are approximately 40 bottles including 9 bigger elegant ones. 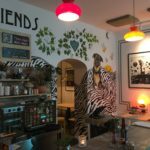 In the middle of the slope that marks starting point of the true hipster area in Göteborg, Majorna, is vegetarian restaurant Blackbird located. 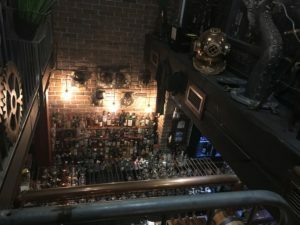 With 2 Craft Beer taps and some 20 interesting bottles (mainly local and some American), you get a good beverage with dinner or just while hanging out. A solid hangout since 45 years, for all crowds. Pilsner Urquell on tap served in 3 different manners (Hladinka, Mliko and Snyt). 4 other Czech beers on tap and 1 guest tap, for instance Oppigårds. 8 Czech bottles including 2 non-alcohol. Don’t expect much rotation. Dogs welcome in the porch. Nice old-time rustic place with balconies round the room and a French touch. Considering the competition in Craft Beer, in the same block, this might be an odd bar. 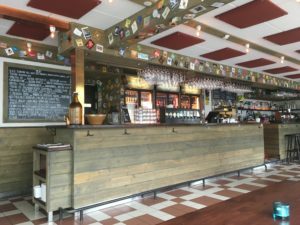 Around 6 Craft Beers on tap (mainly Sigtuna and S:tErik) and around 16 bottles – mostly local – including their house pale ale from local Hönö brewery. Nice Hard Rock hangout with around 30 Craft Beers on bottle, but no interesting beers on tap. 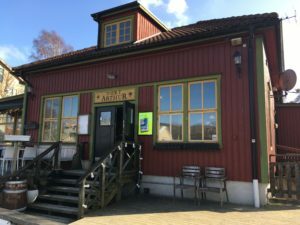 A schnitzel restaurant in an old warehouse close to Göta Älv river. 8 taps pouring German beers like Weihenstephaner, Schlenkerla, Riegele and Köstritzer. 6 bottles. 1 Craft Beer on tap and around 18 Craft Beer bottles including 7 rotating guest bottles. Peruvian food, as the name suggests. 3 beer bottles from Peru and 1 Vega..
1 tap Majornas and 12 bottles. This is the John Scott’s Flagship restaurant/pub in town with a few sister restaurants as well. Their own brewery visible inside the premises making 4 different house brews on tap, including lager, pale ale and also a wit. Those beers haven’t really impresssed the initiated, and neither does the other taps nor 7 bottle selection. Dogs welcome in the in-built outdoor seating. The most cozy of the John Scott’s places. 4 taps pouring different John Scott’s own brews (brewed at John Scott’s Palace), and 3 other Craft Beer taps, for instance including Oppigårds and Bronx. Around 10 bottles, of limited interest. 25 Craft Beer bottles. No interesting taps. Dogs allowed in the first part close to the window. Game hall. 1 tap with an own beer brewed by Två Feta Grisar. 12 bottles. Very nice bottle shop as well as a place to sit down for a 3,5 % beer or two. Around 80 bottles. Pleasant pub with some maybe odd, but still interesting decorations. One Craft Beer on tap (Last time Poppels). The unusual thing are the bottles from Canadian Dieu De Ciel. The selection is slightly varying, but keeps being around 15 to choose from. There is also another 15 bottles including some Australian beers. If no rating below, the place is not listed above. Myabe not so many interesting beers, but this place was built in 1918 and is the very last remaining venue for the sailors and ship builders in old times. Maybe 3 Craft Beers on tap, like their own beer brewed by Göteborgs Nya Bryggeri, Lagunitas and Nya Carnegiebryggeriet. 11 bottles, among them 3 from Ridge Brewery in Falkenberg (town south of Göteborg). Small dogs are welcome in the bar counter area. A historical landmark for beer in Göteborg. 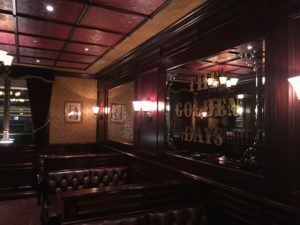 This place opened in 1900 and has been a beer bar ever since! The interior resembles the original, with dark wooden paneling and low stools. 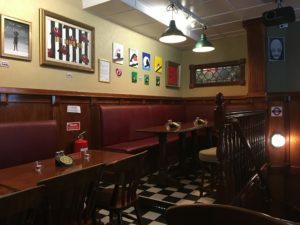 The legend has it that the sketched portraits covering the walls are all regulars that frequented the place every single day for at least thirty years. That’s probably totally made up, but when you see the place it does seem reasonable. Today, there are only major brands in 15 taps, including Leffe Blond, and a few bottles. Carnegie Porter might be worth having at the traditional tavern, though. 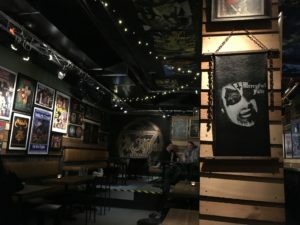 Busy burger and beer bar with Rock memorabilia on the walls. 10 Craft Beer taps (23 taps in all) and around 70 nice bottles. Serves their own house IPA called “If You Want IPA (You’ve Got It), made by the local brewery Beerbliotek. An odd finding by a cozy suburban canal, just off major commuter hub Hjalmar Brantingsplatsen. Around 5 Craft Beers on tap and around 20 bottles, sometimes with an unusual one. There is a Craft Beer ambition, though, with occational tap takeovers, for example with neighbouring brewery Vega. 10 Craft Beer bottles including including 1 own and a few Qvänum. 1 Craft Beer on tap and around 11 Craft Beer bottles. 1 tap and 10 bottles of Craft Beers. 2 taps and 5 bottles of Craft Beers. Around 10 bottles of Craft Beers. 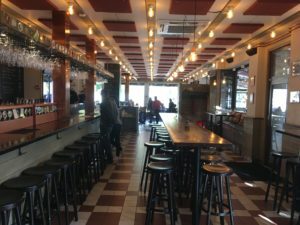 Det är inte bara bryggerier det finns gott om i Göteborg, staden har ett fantatiskt utbud av pubar, ölbarer och restauranger som serverar hantverksöl. Här hittar ni våra åtta favoriter. Från Bingolotto, räkfrossa och stor stark till ett kultiverat och levande ölsamhälle i framkant. Vad tusan var det som hände? Så här blev Göteborg Sveriges ölhuvudstad. Vi reser tillbaka i tiden till händelserna som lade grunden för den västkustska ölstaden. Via öltappare och ölhallar till Prippsövertagande och porter, porter porter. 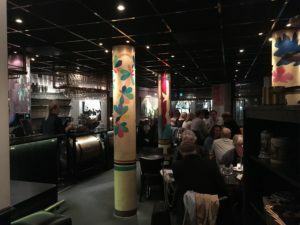 25 våningar ovanför Liseberg, i ett av Gothia Towers-tornen styr Gabriel Melim Andersson köket med närodlat, småskaligt och nyskapande som ledord. 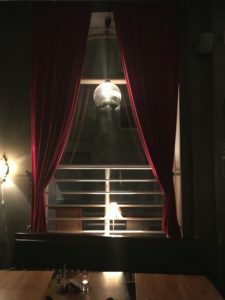 Ytterligare en bit upp, på taket så har de sina egna bikupor och odlar sina egna örter. 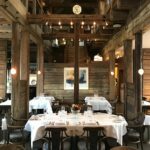 2016 tilldelades Upper House Dining en stjärna i Guide Michelin. Bara ett stenkast från Carnegies gamla sockerbruk och bryggeri, vid Göteborgs inlopp, ligger klassiska Sjömagasinet. 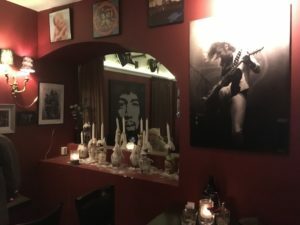 Genom åren har världsartister som Rolling Stones, U2 och Bruce Springsteen ätit fisk och skaldjur här och sedan 2011 ägs restaurangen av kocken Ulf Wagner, som 1989 var den första i Göteborg att få en stjärna i Guide Michelin. Köksmästare är Gustav Trägårdh som 2010 tog hem titeln Årets Kock.